At the pre-lecture workshop, Daryl teaches one or two special tricks that have been specifically saved for the workshop. The students learn these tricks by actually DOING them as opposed to just watching and listening to their explanations. Before the workshop is finished, each participant will have performed each and every step from start to finish multiple times! Daryl’s latest magic lecture is titled 4FXII, pronounced Four F Twelve. Even more so than usual, this lecture contains a wide variety of practical and PERFORMABLE magic. This lecture features close-up magic, stage magic, magic that is impromptu, angle-proof, quickly reset, finishes clean, easy to perform. This has always been Daryl’s favorite type of magic! Time: 7:30 - 9:30 p.m.
Sign up for membership at the event and save big! They each performed routines judged by their peers to be magical, technically sound, and fun to watch. Have a happy New Year everyone and be sure to join us next year for our lecture and workshop with Daryl. 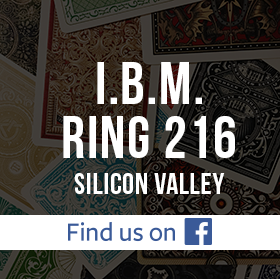 Join us on Wednesday, December 9, 2014, for the IBM Ring 216 Annual Stage/Parlor Magic Competition. If you are interested in competing, please send an email to Cal Tong (president@ring216.org). In addition to the standard division, we will also have our Masters Division if there are enough competitors. So if you have won first place in one of the competition events in previous years, then you qualify for the master's division and can sign up for this event! 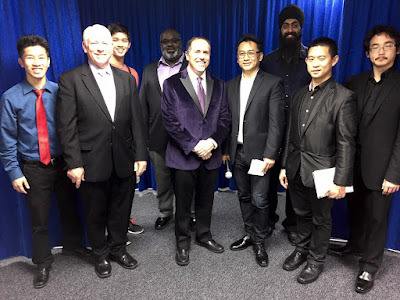 When: December 9, 7:30 p.m.
We had a great meeting night last Wednesday, Nov. 4. Ring officers brought wine, cheese, and crackers. And lots of magicians performed their routines. John Jones announced the winners of the Close-up Competition from October. Congratulations to the winners and to everyone who performed! 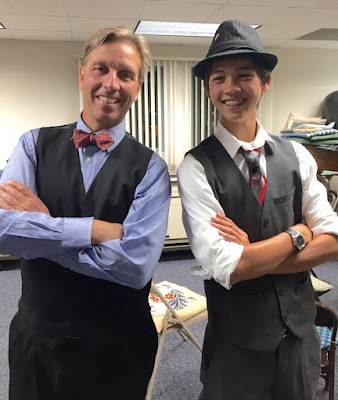 - February: Mini lecture by Stan Sieler on "Writing an Intro Card"
Plus competitions, open performance nights, raffles, and other special events. Please pay your membership dues at the next meeting to enjoy a full year of fun and magic. We had a great turnout for the open performance night. At least 10 magicians performed their routines... mostly card effects but also some mentalism, coin, and silk magic. Get ready for our next meeting on Wednesday, December 9, when Ring magicians will compete in the annual Stage Magic Competition. Bring your friends and family for a fun night of magic. This is different from our normal meeting night, which is the second Wednesday of the month. The reason for the change is that the Yu-Ai Kai Community Center will be closed on Nov. 11 for Veterans Day. At the November 4 meeting, we'll have an Open Performance Night with Wine and Cheese. You're invited to show us your in-progress or polished routine. PLUS, the officers will share with you what's on the menu for next year: lectures, special events, and more. PLUS, our own Fred Lee will conduct a pre-meeting workshop on his vanishing Sharpie routine called CGI (which is taught in our Ring 216 publication, "The Real Magic of Silicon Valley Vol. 2"). The workshop starts at 6:30 P.M.
We had an amazing turnout at our Close-Up Magic Competition on Wednesday, Oct. 14. 45 to 50 people attended, and we had a record number of 12 competitors, six in each division. Scores were tallied for the standard, and the winner was Luke Adams, who won both the magicians' award AND the People's Choice award. Tom Collett came in a very close second. And this was the first competition for both Luke and Tom! All performers did a great job, repeating their routines 5 times to accommodate the huge crowd. Thanks for supporting this magical annual event! Our Annual Close Up Competition event is coming October 14th, and we hope you all can show up to enjoy some great magic and support your fellow Ring members who have signed up to compete. We already have a pretty full slate of competitors, but if you still want to sign up, please send an email to John Jones (vicepresident@ring216.org). All contestants should check the rules and information on competitions. Prior to the competition, we'll take a few minutes to vote on the candidates running for Ring offices. Please arrive ON TIME at 7:30 if you want to take part in the voting. Thank you. For complete details, we invite you to read Fred Rasmussen's post about the elections on the Google group. If you would like to be considered for any position or if you have any questions, please email Fred (fred.rasmussen@ring216.org). At our pre-meeting workshop, Cal will perform and share his signature coin routine, "3 Bits of Silver." It's a three-coin routine that's perfect for walk-around performers. 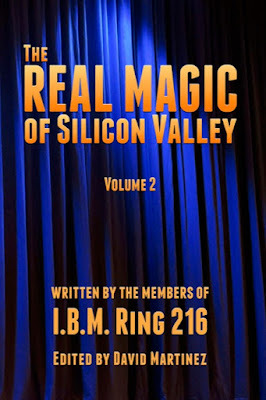 It's also included in the new Ring 216 book, The Real Magic of Silicon Valley: Volume 2 (see below). Bring your finished or unfinished routine to share with the club. If you haven't performed for the club yet this year, this is your chance to show your stuff. 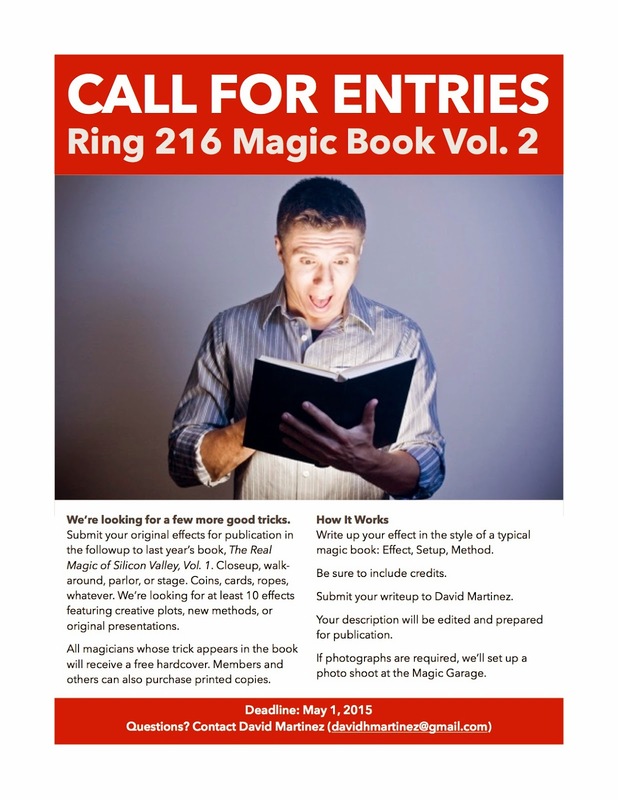 Announcing the New Ring 216 Book! Hot off the presses, the Ring 216 book is now available for order. We'll bring a copy for you to review, and you'll be able to place your order. The cost is $20. Please bring cash or check. This is your chance to learn some great new magic and support your fellow Ring members. The spectators in attendance saw a wide variety of magic involving everything from cards and coins to ropes and bills, and even tiny chickens (!). Congratulations to Alan for winning his first trophy and David for winning his fourth! At our next meeting, on September 9, we'll be having an open performance night. So bring your finished or unfinished routine to share with the group. If you haven't performed for the club yet this year, this is your chance to share your magic. Our Close-Up Magic Competition will be held on October 14. If you want to compete, just send an email to John Jones, who will be running the show. Sign-ups are open for the 2015 Walk-Around Magic Competition. This friendly competition will be held on our regular meeting night — Wednesday, August 12, 2015, at the Yu-Ai Kai Community Center. And even if you don't want to compete, we still want to see you there. Join us to watch the magic and bring your friends and family, too! Fred Rasmussen will lead a pre-meeting teach-in session on the Elmsley and Jordan Counts. He will demonstrate and teach these sleights, and he will show and teach Twisting the Aces and Elmsley’s “One Poor Lion,” which use the Elmsley and modified Jordan Sleights. Strange Ideas is the new presentation from Wayne Houchin whose work as a performance artist, magician, and dare-devil has made him one of the most popular mystery entertainers in the world. Part performance and part lecture, Strange Ideas features a variety of new magic and surprising variations. Attendees will learn magic with needles, string, a helium balloon, dollar bills, cards, and more. Houchin’s magic is powerful and practical, and is suitable for both closeup and parlor style performances. The lecture will start at 7:30 p.m. sharp. The cost will be $15 for paid Ring 216 members, $30 for non-members. We will meet at our regular location at the Yu-Ai Kai Community Center. Wayne Houchin has performed around the world in more than 30 countries. He’s appeared on NBC’s Today Show, headlined the world-famous Magic Castle in Hollywood, and made history when he stopped time during a live nationally televised stunt in Santo Domingo. Houchin currently stars in the Discovery Channel's Breaking Magic / The Magic of Science which has been watched by more than 100 million people worldwide. As usual, the meeting will start at 7:30p.m. sharp. The cost will be $15 for paid Ring 216 members, $30 for non-members. There are still tables available if you want to purchase one to sell your stuff. Contact Will Chandler (treasurer@ring216.org) to reserve yours now. Prices are: Large table $15 for paid members, $20 for non-members; small table, $10 for members, $15 for non-members. No sharing of tables allowed, sorry. There's a wine walk event in Japantown that day. Parking may be difficult, so plan to arrive early to find parking. Sellers, plan to arrive by 6:30 p.m. to help set up the tables and prepare your merchandise. Buyers can arrive by 7:00 p.m. If you have some unwanted stuff, consider donating it to the club. We'll auction it off that night, and the proceeds will go to Ring 216. The Yu Ai Kai facility will be closing the stairs so that wine drinkers will not roam around. Plan to use the elevator. 6:30 PM: Sellers may arrive to set up their tables for the flea market. 7:00 PM: The doors open to buyers. 8:30 PM: The auction begins. Got magic stuff you want to get rid of? Is there anything you have your eye on? Join us at our next meeting on Wednesday, June 10, beginning at 7:00 PM to shop the collections of your fellow magicians — and/or sell the stuff you don't use anymore. Non-members: $20 for a large table, $15 for a small table. There will also be an auction of magical goods. If you're interested in the auction, just show up. Anybody can sell at auction. The club takes a 10% fee for auction sales, but no fee for table sales. 9:30 PM (approximately): All sales end and it's time to pack up. Please note: There will be a wine walk event in Japantown on this day, and parking may be difficult. Please plan accordingly. We moved the time of the auction by 15 minutes to accommodate late-comers. Bring your friends and your stuff — and your cash. Want more details about the auction? Read our FAQ. 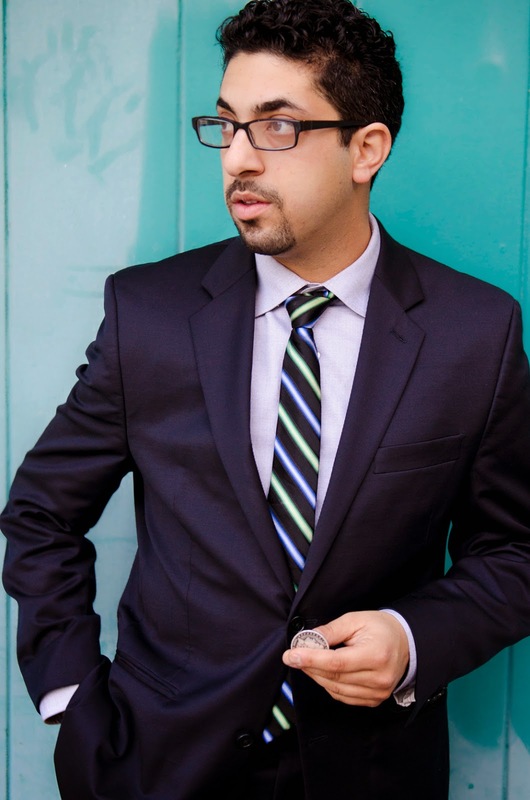 When: May 13, 2015, at 7:30 p.m.
David Gabbay is a talented, award-winning magician and creator of some of the most visual, cutting-edge effects put out in recent years. He's starred in two critically acclaimed theatrical shows in Hollywood, messing with the audience’s perceptions to take them on a reality defying journey. David is a consummate perfectionist, always playing around and tweaking his show based on his audience. This refining has allowed him instant flexibility and control over the flow of his shows as well as recognition from the magic community. In 2011, he won the Texas Association of Magic's 1st Place in Closeup and today is currently one of the Castle’s favorite performers, always in constant demand. keeping a magic journal, blending techniques, connecting with the audience, managing the peaks and valleys of your performance, and routining acts that flows fluidly to keep audiences fully engaged. 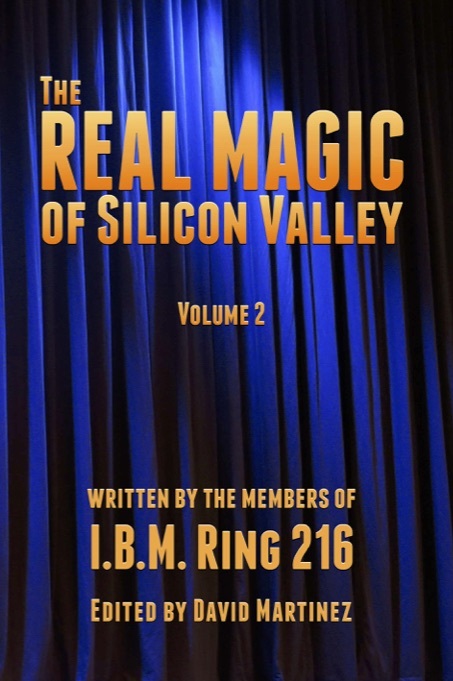 David Martinez, our Ring 216 webmaster and editor of our publication The Real Magic of Silicon Valley, will present and teach his routine "The Nothing Deck," which he performed at the last meeting and published in the book. This effect is simple to do and packs a powerful punch. At the workshop, we'll go over the method and handling, and we'll also discuss David's presentation as well as alternates. This is a free workshop and all members are invited to attend. Join master mentalist Lee Earle for his farewell lecture. Full details are available here (or just scroll down). The lecture will begin promptly at 7:30 p.m. at the Yu-Ai Kai Community Center, so please be on time. The cost is $15 for paid Ring 216 members and $30 for non-members. When: April 8, 2015, at 7:30 p.m.
Lee Earle turned 69 years old in June 2014 and it’s time to start planning for what will probably be his ‘Farewell Tour’. He has spread his love for Mentalism by presenting hundreds of lectures in just about every English speaking country in the world, and in quite a few others - with the help of translators. Magic clubs and enthusiasts are the pool from which Mentalism draws new, fresh talent - and every lecture is packed with real-world advice, ideas, and concepts that have helped numerous entertainers make their move into this lucrative specialty. His unique teaching style divides the lecture into multiple individual segments - each of which includes performance, explanation (while the material is fresh in the audience’s minds), discussion, and advocacy - putting the emphasis on simplicity, practical methods, and personality-driven presentations. Lee always brings a variety of props and videos to every lecture to offer on his back-of-room table. When possible, these items are available at a discount from retail and ‘special deal bundles’ are always offered. While it’s always nice to make a few happy dollars peddling props, Lee’s first priority is always focused on teaching, not selling. Lecture notes are printed and bound booklets. It's been a few months since we've had a meeting entirely dedicated to performances by you. So come join us at the next meeting — March 11 at 7:30 p.m. at Yu Ai Kai Community Center — and bring a trick to perform. Something you're working on, something you're polishing, something fun, whatever. And if you have an announcement to make about upcoming shows, bring that too. See you all on March 11! 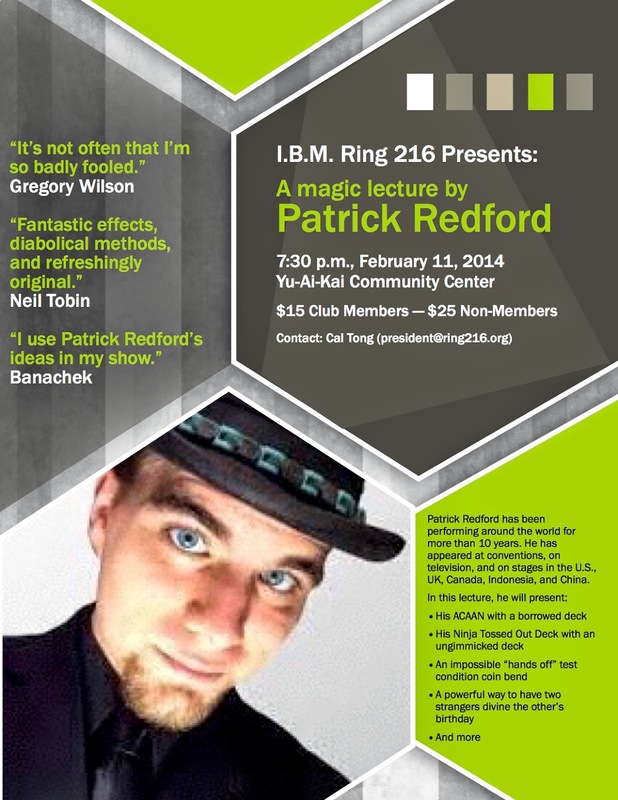 Patrick Redford may be best known for his 2009 mentalism release of Prevaricator that boasts a three hour video course on how to execute the real ability of non-contact mind reading. 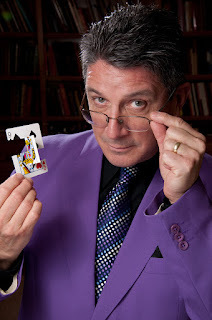 Redford has been featured at a variety of conventions around the world including IMX and MINDvention in Las Vegas, South Tynside’s International Magic Festival in England and most recently featured on the main stage at the largest magic festival in the world in Blackpool, England. He’s been seen on Finnish and American television and seen performing on stages throughout the USA, Canada, Indonesia, Peru, the United Kingdom, The Philippines and Singapore. Get a sneak peek at Patrick’s newest approach to ACAAN with a borrowed deck. A card is thought of and a number is thought of. The performer is never aware of either until the cards are out of his hands and announced by the participants. Witness his Ninja Tossed Out Deck system in action with an ungimmicked deck of cards. Learn an impossible “hands off” test condition coin bend where you never appear to touch the borrowed coin. Divine which person in a group is focusing on a negative thought amongst the sea of happy and then divine and pin point those exact thoughts. We had a great banquet on Saturday, January 17. Performances by Eric Buss and Big Al Catraz highlighted the evening, and we had a great turnout among club members, friends, and family. Congratulations to everyone who attended. Be sure to check out the Ring 216 Facebook page for pictures from the gala event.